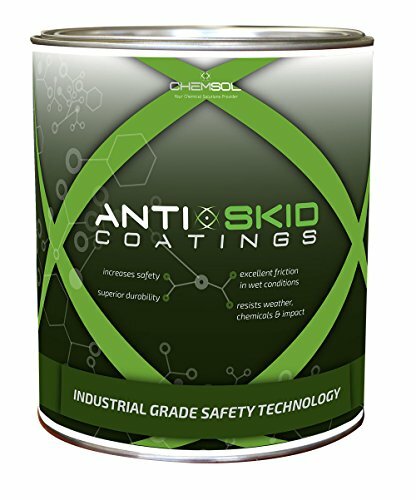 Chemsol Anti-Skid Non-Slip 2500 Safety Coating and Ruggedizer Kit is a two-component epoxy system that yields one gallon when mixed. It is a 100% solids, zero volatile organic compound (VOC) and hazardous air pollutant (HAP)-free fast curing coating. It is engineered to provide slip resistance in areas with heavy rolling and pedestrian traffic. It is suitable for both indoor and outdoor use, and can be used to add traction and ruggedness to a variety of substrates including metals, wood, concrete, PVC, diamond plate, and various other substrates. This product is industrial grade. Chemsol Anti-Skid 2500 is normally mixed with a mixing blade for best results. After mixing, it can be poured onto the substrate. Once the coating is poured onto the substrate, a roller (included) is generally used to achieve an aggressive profile. For reduced profiles (i.e., a flatter look), a nap roller or a brush can be used. Ideal for both indoor and outdoor use, in all-weather conditions. It is fire retardant when dry and has excellent chemical resistance to oil, gasoline, acids, caustics, hydraulic and brake fluids, and most solvents. Chemsol Anti-Skid 2500 has been formulated to meet the strict requirements of South Coast Air Quality Management District Rule 1113. It is USDA acceptable. Chemsol Anti-Skid 2500 is ideal for areas that are normally slippery and areas that pose a slip, trip and fall hazard. Ensure that the surface is prepared in accordance with product instructions, and that the correct primer is used. Consult TDS and MSDS prior to application. Phenolic core roller included. Use indoor & outdoor to increase traction and/or ruggedize concrete, wood, metal, PCV, etc. If you have any questions about this product by Chemsol, contact us by completing and submitting the form below. If you are looking for a specif part number, please include it with your message.